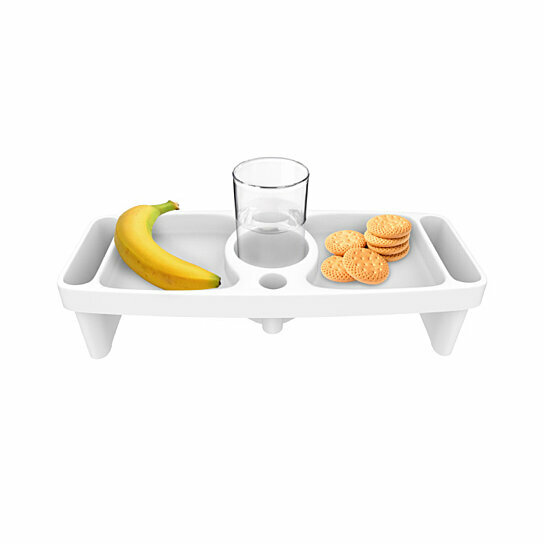 PRACTICAL DESIGN- With a cupholder to hold your drink, and 2 convenient side compartments to store utensils or napkins, the lap tray is perfect for serving and eating breakfast, lunch, or dinner in any room of the home. NO SLIP EDGE- The 1 " raised edge helps to prevent items that you are carrying from slipping off the tray, making it easier to carry from place to place! VERSATILE USE- The compact size of the tray is ideal for indoor or outdoor use in bed, on the couch, recliner, or pool and patio lounge chairs, while the lightweight design makes it easily portable and travel-friendly. USEFUL FOR KIDS AND ADULTS- Both children and adults will love this convenient household essential that makes it easy to enjoy a quick meal or snack anywhere. PRODUCT DETAILS- Material: 100% food grade BPA-free plastic. Overall Dimensions: 16.25 x 6.50 raised edge; 4 deep side pockets.